Many of the young men were already awake. Some boasted of not having wasted a second to sleep during their last weekend stateside. A handful of Marines stood in an open stairwell smoking cigarettes and exhaling Budweiser fumes. It was 4 a.m. Monday and the stars were still over the desert. The Marines were about to go to war. Lance Cpl. Matt Shipp, 19, of Hauser Lake, Idaho, was tired but relatively rested after three nights in a quiet, air-conditioned Holiday Inn a few miles off base. Matt’s wife of four months, Jessica, had driven with him from the hotel to the barracks that morning, where he reported for duty with India Battery of the 3rd Battalion, 11th Marine Regiment. Jessica, who wanted to spend every last minute with her husband, sat expressionless on a bare mattress lacing a new pair of beige boots while Matt shoved gear into a backpack: T-shirts, socks, digital music player, bayonet, body armor. Matt’s bunkmate and close friend, a 24-year-old Texan named Colt Remington, brushed his teeth and slid a hand atop his freshly shaved head – all the guys in the unit without combat experience had their heads shaved bald the night before. “I miss my hair,” Remington said, peering into the mirror. Apart from his rifle and night-vision goggles, which he would pick up at the base armory shortly after dawn, Matt had everything he needed for the next seven months – or possibly longer. He had been preparing and training for this moment for 16 months, ever since he stepped off the bus at boot camp with his twin brother, Robert, who is serving with an infantry unit and expects to be deployed overseas next month. Since basic training, Matt has learned the fundamentals of firing howitzers, surviving in the desert and spotting roadside bombs. He knows a few words in Arabic. But there are some lessons not offered by the Corps: how to exist away from a twin, how to cope with saying goodbye to a new bride. Jessica finished lacing her husband’s combat boots – stringing a metal dog tag into the laces – then reached out and grabbed her husband’s arm. Matt leaned over and kissed her. Matt bought an engagement ring while he was stationed for artillery training at Ft. Sill, Okla. On Christmas night – after first talking it over with his brother – Matt asked Jessica to be his wife. Although they had dated for nearly three years, Jessica, 21, hadn’t expected to marry quite yet. But she couldn’t bear being apart from Matt and, as an unmarried partner, had few chances to see Matt while he was training. They were married May 27 at the shore of the lake where both had spent their childhoods. Matt’s parents, Dennis and Leslee, hosted the ceremony and reception at their business, the Hauser Lake Resort. Robert was given 48 hours leave to be in his brother’s wedding. Matt flew home two days before the ceremony. Some of his Marine buddies also showed up, including a recent returnee from Iraq sporting fresh shrapnel scars on his forearms. Jessica wasn’t expecting the war to intrude on their lives so soon, but she knew Matt would eventually go. Even before they began dating, Matt made a point of telling her he intended to join the Marines someday and that he was willing to give everything for his country. When the brothers enlisted, they chose the Marines with the hope and expectation they would serve in combat. Weeks after the wedding, Jessica put her studies on hold at North Idaho College, quit her job at a pawn shop in Hayden and moved to Twentynine Palms, Calif. The $943 monthly housing allowance offered to a married lance corporal wasn’t much less than her paycheck, she said. The couple saved money by sleeping on an air mattress in the spare bedroom of a corporal in Matt’s unit. Twentynine Palms is little more than a huge Marine base – nicknamed not so affectionately “The Stumps” – and a scattering of cinder block ranch homes in the desolate Southern California desert. But these were salad days for the newlyweds. Most nights and weekends they were together. They made a couple of visits to Robert, who is stationed at Camp Pendleton, on the Pacific Coast three hours away. Matt would sometimes go on long training exercises, returning home covered with dust and reeking of sweat. He knew to remove his boots outside. 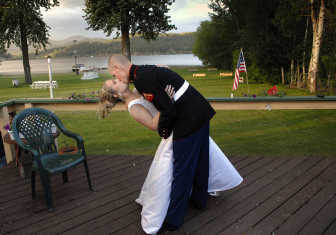 The couple’s homesickness for the lakes and mountains of Idaho did little to slow the pace of days before deployment. They did their best to focus on matters other than war. They tried to think about the future – Jessica is thinking about studying to be a guidance counselor. Matt is considering another four-year hitch with the Marines. They’re looking at buying some land near Clark Fork, Idaho. But the war was always there. “It’s this huge thing in our lives,” Jessica said. They also avoided discussions about the bigger issue of America’s involvement in Iraq. Matt is conservative and remains committed to the belief that if the war is not fought in Iraq, it will eventually need to be fought at home. Jessica is more moderate in her beliefs and isn’t quite sure what to think about the war, apart from knowing she’ll worry about Matt every second he’s gone. As much as they tried to lead normal lives, the war was constantly rumbling in Twentynine Palms – and not just from the base’s artillery training range. There always seemed to be a unit deploying or coming home from battle. Jessica also became acquainted with the wives of Marines who had been in Iraq. Some talked of their husbands returning with physical and mental wounds after surviving blasts from roadside bombs. One husband had been “blown up” a couple of times, Jessica said. Another had trouble driving because of fear brought on by piles of litter along California highways. Some of the Marines seemed no different when they returned, she said, apart from wearing the peculiar, helmet-framed facial tan. “I just want it to be an OK trip – everything comes back attached, mind working perfectly,” Jessica said. The weekend before Matt deployed, his parents, big sister and younger brother flew down from Hauser. Matt’s twin couldn’t be there – Robert was at sea, training for his deployment next month. The two said their goodbyes by phone. Matt was quiet for a long time after the call, Jessica said. Even after a year, the brothers have not gotten used to being apart. The night before deployment, Matt and his family drove to Pioneertown, a desert steakhouse that once served as a movie set for classic cowboy Westerns. Hank Williams Sr. played on the jukebox as the family laughed, talked and ate barbecued ribs and steaks. Less than eight hours later, Matt was awake and standing in the barracks parking lot beside other Marines and Navy corpsmen mustered for departure. They stood clutching wives, girlfriends and young children in the pre-dawn darkness. It was cold, but no one was eager to see the sun – by late morning, the 125 Marines of India Battery would be gone. Buses would take the men to an Air Force Base two hours away. By sunset, they would board a charter jet bound for Kuwait. Today will likely be Matt’s second morning in Iraq. Matt’s unit is the first Marine battery to be deployed to Iraq with a new precision-guided “Excalibur” artillery system. The digitally launched howitzer shells are shot steep into the sky and guided by satellite to targets as far away as 30 miles. The weapon is expected to be a valuable rapid-response tool in support of Marines in urban warfare, India Battery’s commanding officer, Capt. Stephen Ford, told the base newspaper, the Observation Post. “It makes artillery relevant in theater again,” Ford said recently. Although some in the unit will work cannons, others, including Matt, were told to expect infantry duty. They will patrol villages in Anbar province and pull shifts in guard posts. Matt isn’t certain where he will be sent or what his duties will be, but he was told to prepare for deployment to a forward operating base. These are small outposts where the comforts are few, and the duty can be especially tough. “I don’t really know how it’s going to be,” Matt said. Unlike many other troops, he doesn’t expect to have access to the Internet or a satellite phone. Before leaving, he recorded messages on Jessica’s cell phone so she could hear his voice during the lonely days ahead. She plans to write him each day, as she did during boot camp. Although it’s hard for most 19-year-olds to imagine a world without constant access to e-mail or cell phones, Matt compared his impending media blackout with the experience of Marines during World War II, when some went years without any contact with home. Jessica also tried to put the deployment in perspective. “It’s a small part of a long life together,” she said. Shortly after sunrise, a semi truck pulled up. Marines loaded their packs into the trailer then walked to the base armory to pick up their rifles. They were then ordered to return to the barracks – it hadn’t passed inspection and needed another cleaning. Married Marines who lived off base grumbled and swore as they walked up the stairs to mop the floors and clean up the bachelors’ cigarette butts and empty beer bottles. By the time the barracks had been cleaned and rifles issued, the men had little more than an hour left. Those who weren’t kissing wives or girlfriends were having intense conversations on cell phones. One Marine sat on the grass cleaning his M-16 while his wife sat on the open gate of a new pickup truck. Another repeatedly kissed his pregnant wife’s belly. The Marines were called to formation while the chaplain offered a prayer, and Sgt. Maj. Robert Caldwell spoke to the families and guests. Three school buses pulled into the parking lot at 11:20 a.m. and turned off their motors. Jessica held onto Matt’s arm. Nearby, a tall sergeant cradled an infant while his wife struggled to control a toddler. Leslee Shipp took a deep breath. She reached out and squeezed her son. “Oh, man,” she said. Jessica buried her face in Matt’s camouflage uniform. Bus engines revved. Time to go. Matt hugged his parents and siblings. He kissed his wife and held her tight for a few more seconds. He said he loved them. Then, he picked up his rifle and stepped onto the bus.